BEAVERTON, OR--(Marketwire - August 6, 2008) - Software engineers at a maker of wireless metrology devices for wafer processing equipment, CyberOptics Semiconductor, Inc. (CSI), have recently developed companion applications that allow fab engineers to evaluate equipment acceleration and vibration via comparative analysis of log file data and real-time frequency and spec-limit readings in conjunction with the company's wafer-like accelerometer -- the WaferSense Auto Vibration System (AVS), according to Dennis J. Bonciolini, the company's CTO. The amplitude and frequency of vibrations generated by fab process equipment and automated material handling systems, when tracked, effectively serve as predictors of robot and transfer-equipment failures and indicators of both wafer particle-contamination sources and inefficient movement by cassettes, SMIFs and FOUPs, according to Bonciolini. Bonciolini said the company, a subsidiary of CyberOptics Corp. (NASDAQ: CYBE), developed the new software -- partly due to demand from fabs -- to help process engineers further review and analyze data generated by the wafer-like AVS. 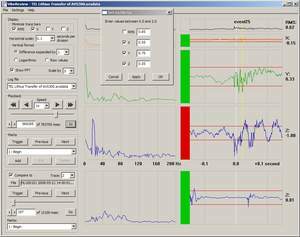 Engineers use the data to establish yield-based vibration standards for equipment and technicians, identify links between vibration frequency, such as isolated shocks versus steady humming, and likely sources and acceptable acceleration parameters for equipment. "With the data, you can see that there's really a direct relationship between yield and the speed and vibration of equipment across the fab," Bonciolini said. "The more you optimize acceleration and limit vibration, you're going to encounter less downtime and contaminated wafers and improve your cycle time." The company's new VibeReview 1.5 for AVS replays stored log file data for engineers to compare different run-times, tools and trigger values for acceleration during wafer transfer in x, y and z directions at a range of +/-2G. The improved VibeView 1.5 for AVS allows engineers to evaluate vibration frequency between 0 and 200 Hz and establish ongoing, real-time spec limits or go, no-go values, including RMS. Users can also pause and resume data recording, create log-file titles and export data to Excel and MATLAB. Bonciolini added that CyberOptics Semiconductor also reduced the form factor of the AVS device's carbon fiber composite housing to develop a lighter, more flexible 300mm version. The light 300mm device now weighs 190 grams, down from 225 grams, and is primarily designed to enter slit valves and vacuum chambers without exposing process areas to the environment. "The lighter device can access more equipment at 300mm fabs and essentially identify more wafer-damaging processes," Bonciolini said. WaferSense AVS' key specifications and features include form factors of SEMI 200mm notch or flat and 300mm, range of +/-2G, resolution of +/-0.01G, operating pressure of 760 to less than 10 -6 Torr, operating temperature of 20 to 70 degrees Celsius, height of 6.3mm, weight of 150gm at 200mm and 190gm at 300mm (light), wireless Bluetooth link, four hour run-time per battery charge and use with Windows 2000, XP and Vista. The WaferSense AVS package includes the vibration-sensing wafer, USB-compatible link, VibeView and VibeReview graphical software CD, charging case and suitcase. The WaferSense family of products includes the Auto Vibration System (AVS), Auto Leveling System (ALS), Auto Teaching System (ATS) and Auto Gapping System (AGS). Each device follows the processing life of a wafer. CyberOptics Semiconductor develops automated products that seamlessly measure critical parameters in semiconductor fabrication processes and equipment. 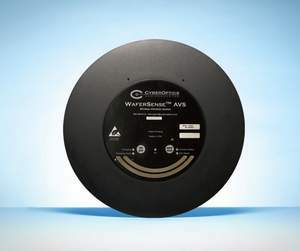 The company's pioneering WaferSense line includes wireless metrology devices for vibration, leveling, gapping and teaching semiconductor process equipment. The company is the largest producer of reflective wafer-mapping sensors and a leading provider of frame grabber machine vision boards under its HAMA Sensors and Imagenation brands. CyberOptics Semiconductor is a subsidiary of CyberOptics Corp. (NASDAQ: CYBE), one of the world's leading providers of process yield and throughput improvement solutions for electronic assembly and semiconductor capital equipment companies. For information, visit http://www.cyberopticssemi.com/, e-mail CSsales@cyberoptics.com or call 800-366-9131. "Safe Harbor" Statement under the Private Securities Litigation Reform Act of 1995: Statements regarding the Company's anticipated performance are forward-looking and therefore involve risks and uncertainties, including but not limited to: market conditions in the global SMT and semiconductor capital equipment industries; increasing price competition and price pressure on our product sales, particularly our SMT systems; the level of orders from our OEM customers; the availability of parts required for meeting customer orders; the effect of world events on our sales, the majority of which are from foreign customers; product introductions and pricing by our competitors; unanticipated costs or delays associated with the transition of engineering and manufacturing for SMT Systems to Singapore and other factors set forth in the Company's filings with the Securities and Exchange Commission. About this company CyberOptics Semiconductor, Inc.